If you've been watching the TLC show "Extreme Couponing," you're probably fascinated by the immense stockpiles that the couponers shown have in their homes. Hundreds of rolls of toilet paper, dozens of bags of chips, storage shelves in the bedroom and closets... the amount stored is just stunning. 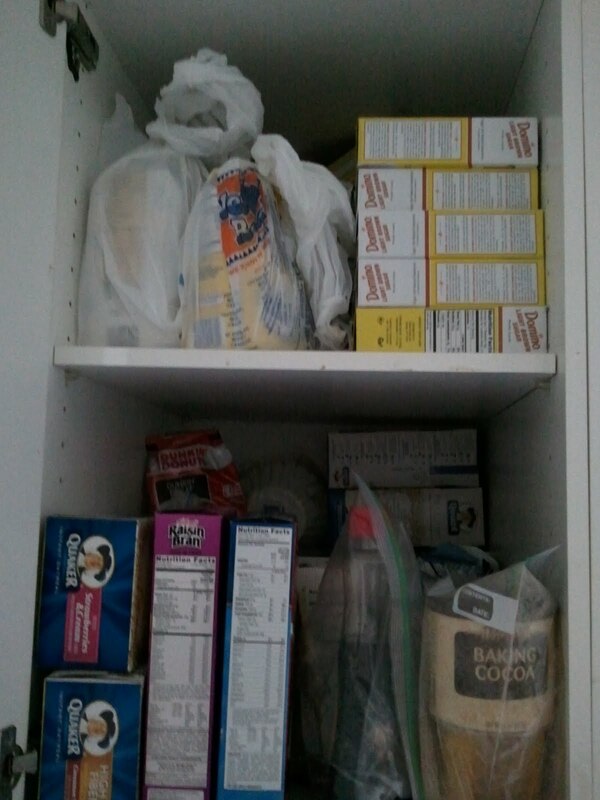 But stockpiling isn't about getting as many items as you can. It's about providing for your family's needs, and being able to have extra on hand to help a friend or neighbor, or to donate to your favorite organization. Figure out what foods you want to store. Just because you like a particular kind of food doesn't mean that you should have tons of it on hand. You might buy a couple when it's on sale, then go without until the next sale. Save your space for the things you eat regularly. Decide how much space you want to devote to your stockpile. Don't let the stockpile grow beyond the space you've chosen. Figure out how much you want to store. Most items go on sale about once every three to six months. So you really need to store three to six months' worth of any item. Some items go on sale seasonally - for instance, condiments are often on sale during the summer, when they're used for barbecues. So you might buy one year's worth of ketchup at the best summer sale. Keep an eye on how much you use - do you go through one box of pasta a week, or three? This will depend on your family size, visitors you might have regularly, and how much you like certain foods. Calculate how many of each item you'll need. So if you use two boxes of pasta a week, and you want to have three months' worth, you'll need 24 boxes of pasta in your stockpile. When you do find a good sale, check how many items you still have in your stockpile. Buy only to fill up the stockpile, and no more (unless you want to donate items to charity or to give to friends). If you buy items that are free or are moneymakers, but they aren't items you could imagine using, don't even let them get into your shelves! Keep a box for donations in a different place than your stockpile, or keep it in your car and take it when it's convenient. 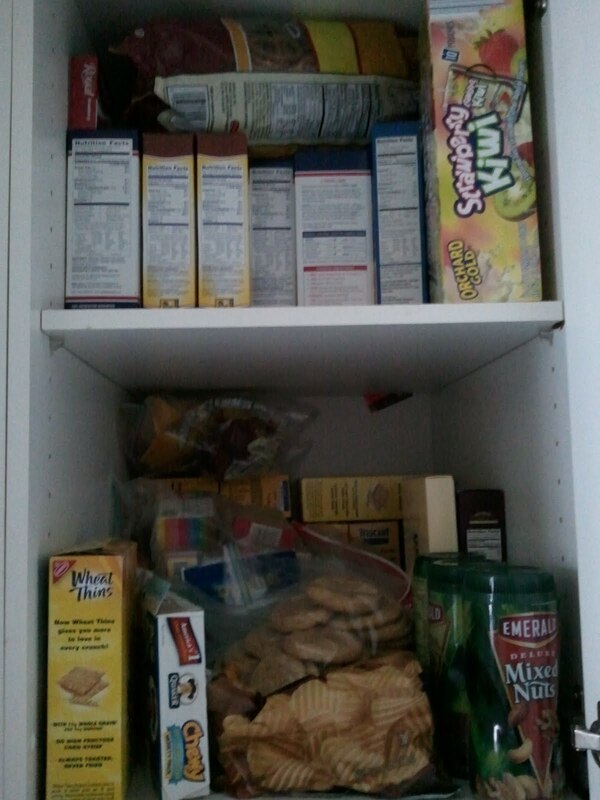 I keep all of the food items in the pantry in my kitchen. 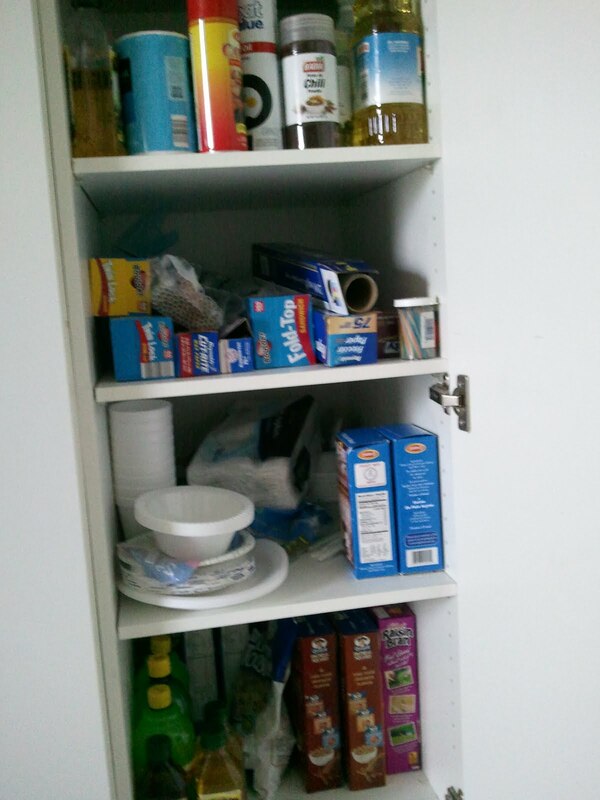 It's four cabinets, totaling twelve shelves. See? Not all that much. Yet I'm able to feed my family on $80 per week, and very rarely do I have to buy a food item at full grocery prices. It looks like you have a healthy stockpile. I watched that show and I just can't imagine having 62 bottles of mustard. That is just ridiculous. $80 per week is doing great. You've obviously mastered a balance between stockpiling and being realistic. Good tips! I definitely don't do enough stock-piling, but I agree with you that there's such a thing as too much. I got really excited about the whole Walgreens couponing system a few years ago, until I realized that even if it's free, I don't need a blood-sugar monitor, or a dozen cans of Lysol! I think I need to make a list of what I go through and how fast. It's nice to see a 'reasonable' stock pile after so many enormous ones. Thanks for sharing. "Keep an eye on how much you use - do you go through one box of pasta a week, or three? This will depend on your family size, visitors you might have regularly, and how much you like certain foods." --This is important information to know (or have written down)so as you check expiration dates you can make sure you'll use up what you're buying before it expires. Great tips! I feed our family for $80 a week too! 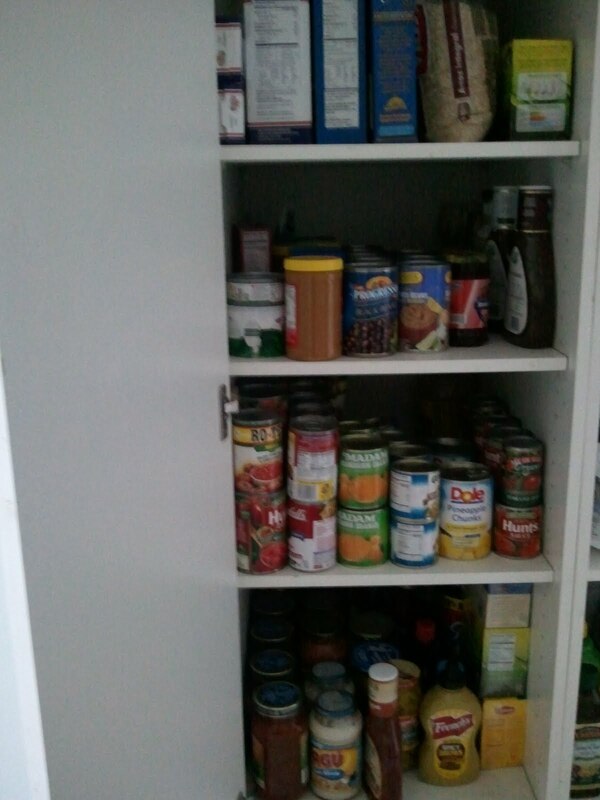 Thanks for the pictures of the stockpile! 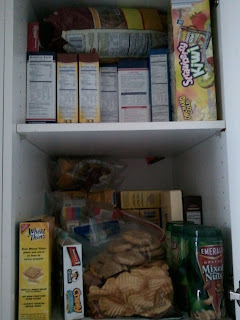 I really need to get more organized about how I stock up on foods. I'm always finding a stray bottle of expired BBQ sauce or old crackers I stocked up on when they were on sale. I have a modest stockpile, nothing crazy. Just about 3 month's worth of anything. I'd say the products we use more than anything are pasta, canned tomatoes (for sauce) and butter. I ran out of butter so now I'm looking for sales to restock the freezer. I'm waiting for the post-Passover sales. I'm not Jewish but I always find Kosher foods to be of very high quality--especially when they are half price or cheaper! 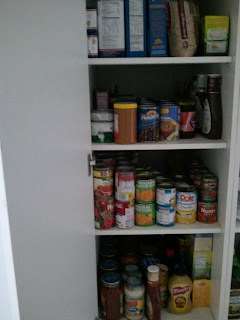 That show is very interesting, but it brings on a question: when does stockpiling become hoarding? I look at those boxes and cereal and bags of chips and wonder how many will still be fresh when they are opened? And who needs to be eating that many chips, anyway, LOL? Great advice. I love your non-extreme outlook!! 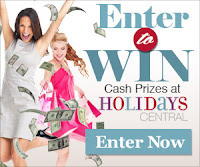 I just found you from the Friday Frugal Blog Hop! 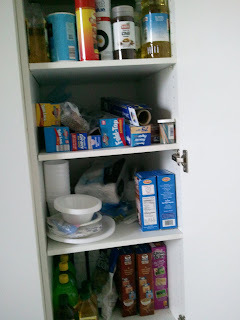 I completely agree with your not so extreme couponing/ stockpiling approach. When people ask to see my stockpile, I tell them my bathroom clost isn't that exciting :-). Here's my response on Real Life Deals! Great tips! I stock pile in my pantry pasta, chicken broth, Pomi, snacks and butter and breads in my freezer like English muffins, loves and bagels when they all are on sale. You are right about how often they go on sale so there's no need to over purchase. I do use coupons and try to stockpile about a month's worth of groceries. (I don't have space for more than that!) I saw the extreme couponing show for the first time last week and it sort of made me sad. I'm not sure exactly where stockpiling crosses the line into hoarding but I know the result isn't pretty.